A North Korean university has named the US citizen detained on Saturday as Kim Sang-duk, also known as Tony Kim. 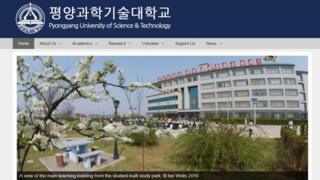 The Korean-American lecturer taught at Pyongyang University of Science and Technology (PUST) for several weeks prior to his arrest. The investigation into Mr Kim was for matters "not connected in any way" to the university, PUST said in a statement to the BBC. Mr Kim was arrested just as he was about to leave Pyongyang. According to South Korean news agency Yonhap, Mr Kim, who is in his late 50s, was involved in aid programmes and had been in North Korea to discuss relief activities. He reportedly taught at Yanbian University of Science and Technology in China, which is affiliated to PUST. The BBC's calls to Yanbian were not answered. PUST's chancellor, Park Chan-mo, was quoted by Reuters news agency as saying that Mr Kim "had been involved with some other activities outside PUST such as helping an orphanage". The US State Department said it was aware of reports of the detention, but would not comment further because of "privacy considerations", US media reported. The detention comes as tensions ratchet up in the Korean peninsula, with US warships steaming towards the region as Pyongyang threatens a "super-mighty pre-emptive strike". Chinese state media reported that President Xi Jinping and US President Donald Trump spoke on the phone again on Monday. Mr Xi reiterated his call for calm saying he "hopes relevant parties exercise restraint, and avoid actions that would increase tensions", and both leaders promised to keep in touch regarding the Korean peninsula, reports said. The US has in the past accused North Korea of detaining its citizens to use them as pawns. Mr Kim is one of three US citizens currently being held by North Korea. In April last year, Kim Dong-chul, a 62-year-old naturalised US citizen born in South Korea, was sentenced to 10 years' hard labour for spying. He was arrested the previous October. US student Otto Warmbier, 22, was arrested in January last year for trying to steal a propaganda sign from a hotel while visiting North Korea. He was given 15 years' hard labour for crimes against the state in March 2016.